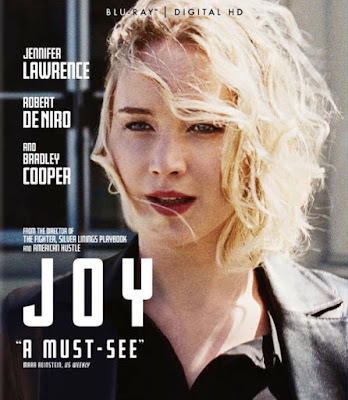 If you didn't have the opportunity to see Joy in the movies this is a must see and is available on Digital HD today the 38th anniversary of my mother's passing April 8 and Blu-ray May 3! Jennifer Lawrence was absolutely amazing in this movie. I had to keep reminding myself this was Katnis of The Hunger Games. Jennifer plays Joy an every day woman, mother, wife and care taker to her mother. This is a rags to riches story that will have you believing you can do anything if you really want to. Picture this... circa 1980s...Joy Mangano has an idea for a mop that will enable housewives everywhere to not have to touch the nasty dirty water with their hands. It's the onset of QVC and American's everywhere are glued to the channel and purchasing goods from the comfort of their own beds and couches. If Joy can get her product hawked on the channel just maybe she can be a success. There is only one problem. She has to get QVC to approve her product. Joy is not going to give up either and thanks to Bradley Cooper (imagine), she talks him into allowing her mop to get on air. Unfortunately the Prima Donna who is selling it to the audience has no idea what he is doing. Joy doesn't give up and eventually breaks QVC records and goes onto greenlight other inventors when she starts her own company. The supporting cast is wonderful too with Robert DeNiro, Virginia Madsen, Diane Ladd, Isabella Rosselini. I loved this Underdog story of a woman who never gave up her dream.